When life hands you lemons, say "Thank you." Lemons are often an afterthought, used as a garnish on a fish fillet or a light addition to your iced tea. What you might not realize is that lemons are loaded with nutritional benefits that go far beyond the role of a garnish. 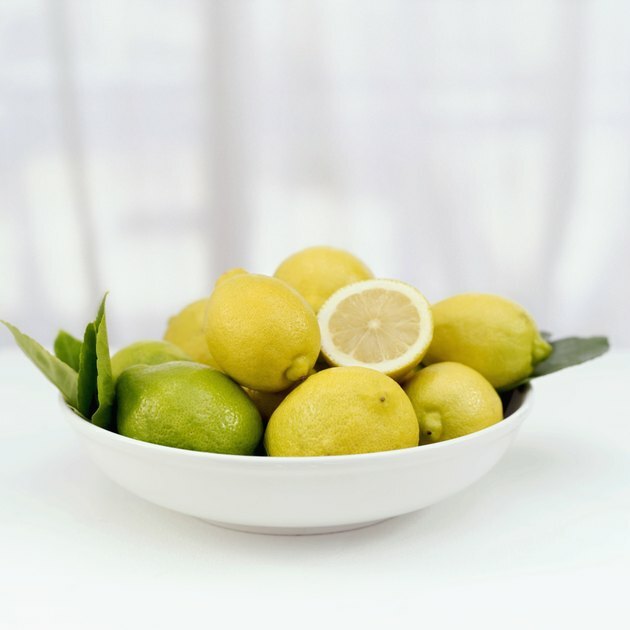 To partake of the benefits in lemons and lemon juice, add more of it into your daily routine by squeezing some on your green salads or mixing it with a cup of plain warm water for a daily wake-up drink. Lemons are exceptionally high in their vitamin C content, especially for their size. Just 1 ounce of lemon juice, which is approximately equal to 2 tablespoons, contains 12.9 milligrams of vitamin C, or 21 percent of the recommended daily value as per nutrition data from the U.S. Department of Agriculture. Vitamin C is a powerful antioxidant, meaning it protects cells in the body from free radicals, which are damaged cells that in turn can cause damage to otherwise healthy cells. Other vitamins in lemons and lemon juice, although present on a much smaller scale, are the B vitamins of vitamin B6, folate and thiamin. The mineral content of lemons includes potassium at 34.7 mg or 1 percent of the recommended daily intake and calcium, magnesium and phosphorous in trace amounts. Lemons contain compounds called limonoids, which are responsible for the bitter taste. Like vitamin C, limonoids have antioxidant properties and they help destroy free radicals that roam about the body. According to a report in the April 2005 issue of the "Journal of Nutrition," the limonoids in lemons also have the ability to help prevent the development and growth of cancer cells. When tested against human cancer cells, limonoids not only slowed the growth rate of cancer cells, they also were responsible for the rapid death of the cancer cells. High blood sugar occurs when your body either can not make insulin or it doesn't respond to insulin as it should. If left untreated, high blood sugar can cause other complications such as problems with your eyes, kidneys and heart. Lemons contain a compound called hesperidin, which can positively alter the function of enzymes in the body that affect blood sugar levels. This action, according to the January 2010 issue of the "Journal of Clinical Biochemistry and Nutrition," helps lower blood sugar levels, protects the body from the early stages of diabetes and helps prevent complications from diabetes if high blood sugar is already present. Not only does hesperidin help control glucose levels, the same study reports that it has cholesterol-lowering effects as well.